‘Building Opinions: PassivPod Holiday Homes’ in Latest Homes, July 2014. 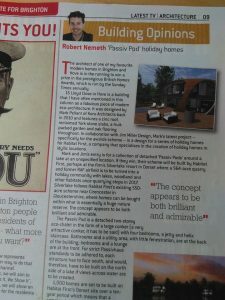 Columnist Robert Nemeth featured our innovative PassivPod design, which at the time was an entry in the Sunday Times EcoHaus competition, in weekly free magazine Latest Homes. He writes a regular column called ‘Building Opinions’ where he showcases interesting architecture around Brighton and Hove. Our PassivPod was a finalist in the Sunday Times 2014 competition and recently took part in the Virgin VOOM 2016 competition as well. You can click here to read the online version of this article on the latest.co.uk. We are now working on the technical design for PassivPod and are planning a crowdfunding campaign to finance a full scale prototype, with a view to eventually rolling the zero-carbon holiday pods out on a commercial scale.